davidyenoki.com – Page 13 – My name is David Yenoki and I should approve of this message. So this is like a review I posted on Goodreads and I’m reposting here, but with spoilers. Once upon a time…a few years ago I came across a book called the James Deans and I read this book that was not about a boy band with a 1950s theme. This was my first introduction to Reed Farrel Coleman and he’s on my list of “mystery genre authors I will read.” Sadly, that’s a small list but what you can do with a finite amount of life to read with. I think the only other authors on the list are Don Winslow and Charlie Huston. Author David YenokiPosted on March 6, 2013 July 20, 2013 Categories booksTags books, good, netgalley, New York, Reed Farrel ColemanLeave a comment on Tower? Oh. Last night I was on the elliptical machine when my iPod nano shuffled to Gerudo Valley, track 4 of The Legend of Zelda 25th Anniversary Special Orchestra CD. The CD was a special pack in with The Legend of Zelda: Skyward Sword which I regrettably didn’t play as much as I have played the soundtrack. Yesterday I found out that Viz (VizKids) published a translation of the Legend of Zelda manga series and I may have purchased all ten volumes. I was reviewing one for Edelweiss but didn’t realize there was a whole series. I had finished Ocarina of Time Part 1 and wanted to continue on so I checked at the bookstore I was in and on the shelf I found all ten of them sitting there, waiting for me. I immediately looked online and read about the ten volumes — hopefully soon to be more than ten with the upcoming release(s) for Skyward Sword — and perhaps as a rash impulse buy I grabbed all of them. Anyhow: positive review, both for the CD and the Legend of Zelda Ocarina of Time Part 1. One jar containing a fairy out of one jar slot. Edit: I forgot to mention that Koji Kondo is responsible for much of the Legend of Zelda music. I found a tin of amazing awesome delicious crack at Trader Joe’s. 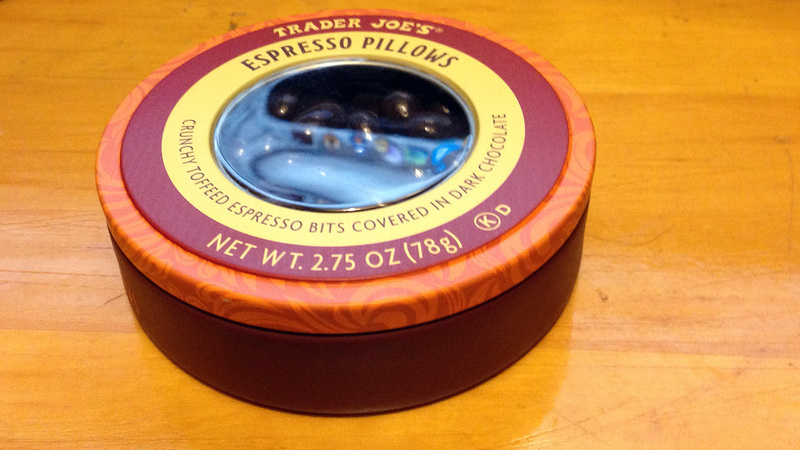 Espresso Pillows which are self-described as “crunchy toffee espresso bits covered in dark chocolate.” I describe them as an amazing taste explosion of tasty bits. I like chocolate covered espresso beans but the addition of toffee makes it even better. Serving size about 22 pieces (15g), 70 calories. This is a positive review. One super happy face. 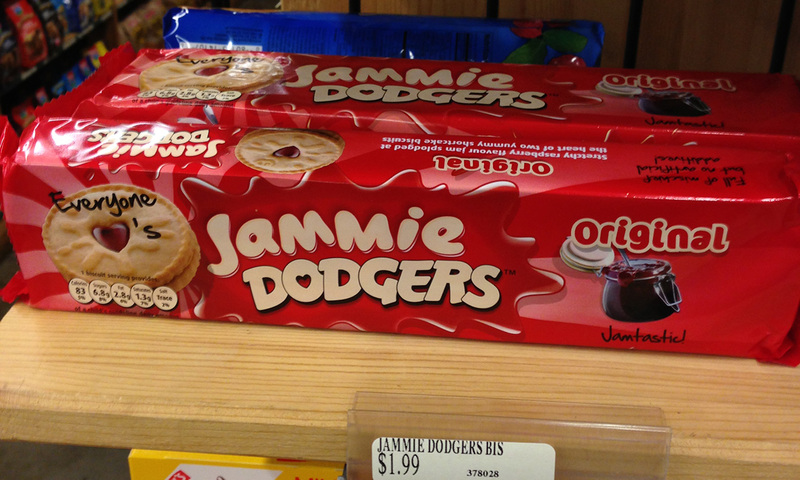 I was at Cost Plus when I came across some Jammie Dodgers and of course I’ve heard about Jammie Dodgers because I watch Doctor Who. Of course, being American means not having first hand experience with things like the Cheeky Chicken of Nandos (WHY IS NANDOS CHEEKY? 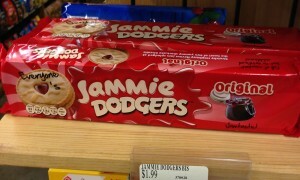 Or rather, how) and of course the Jammy Dodger. And then I didn’t buy any because I thought oh my, it’s a pack of biscuits (cookies) and I’ll just eat them all and get fat. I have so many containers of foodstuffs I’ve purchased and I haven’t eaten because I don’t want to open it because an unopened container of sweets doesn’t hurt anyone. Well…I guess theoretically someone who needs to eat the sweets to survive but I refuse to acknowledge the existence of sugar vampires. I made my purchases and went out to the car and sat for a bit considering and then I looked at the picture I had taken inside the store and then came to the conclusion that it was only $1.99 and I could probably distribute them to others. So yes, I went back in and purchased them. Taste wise, it reminded me of a mild shortbread and … swedish fish. I like swedish fish, but I expected it to be more jammy. I guess I could include a picture of the biscuit but they’re in another room now and if I open the bag again I might just eat another. It gets one smiley face out of one smiley face. This is a positive review.